Linton Deck, a retired superintendent and AASA member who spent nearly two decades in school leadership roles, tells of a superintendent announcing his departure after accepting a new position unbeknownst to anyone in his school district. While typically lacking such public revelations, every superintendent moves on professionally at some point, whether by personal choice or someone else’s. Superintendents are, more often than not, short-term hired hands, migratory workers on a professional level. 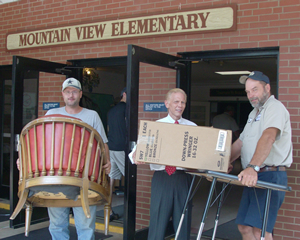 Art Stellar (center), shown helping close down an elementary school in Morganton, N.C., moved in and out of the superintendency a half dozen times. How we transition from one leadership post to another — especially when under pressure — can affect the reputations of individuals and entire communities. During the transitions relating to my half dozen superintendencies over a 25-year period, I’ve had to deal with three overlapping stages that likely make up most departures: (a) recognition, (b) disengagement and (c) recovery and reflection. As a superintendent, you may have the opportunity to decide when it is time to go, or the board may decide for you. Early recognition helps. The allure of other positions may be motivating for a number of reasons, such as compensation, prestige or more opportunity. On the other hand, the desire to escape a dysfunctional governing board may be reason enough for job exploration or retirement. Of course, looking for employment while serving in the superintendency can accelerate one’s exit. Some in the community will express the feeling “If you want to be elsewhere, we don’t want you here.” Superintendents should keep job searches low key, although that is nearly impossible in the age of instantaneous communication. A superintendent not quite a full year into his role in the Pacific Northwest accepted the chance to interview for an appealing position elsewhere. By the time he returned from his out-of-town visit, his fate was sealed. Not selected for the vacancy and pushed out of another, he retired. In another situation, a respected Midwest superintendent with seven years of tenure was a finalist for two positions. When the inside candidates were named in both places, his shunned board coerced a settlement with him leaving within weeks. Periods of calm are good for reflective career planning. How many more years in your current superintendency are reasonable? What are your career goals? When is retirement desirable? The more clarity you have about what you want to accomplish and what kind of environment will best suit you, the better target you have. Savvy superintendents only discuss leaving a job with family or very close friends. There is no need to add to the rumor mill. Coming to a decision usually is a slow process. Epiphanies may occur — before, during or after a board of education meeting. In one urban/suburban school district in a Northeastern state where I worked, a superintendent would vomit before or after every board meeting. At the point the stress was wrenching his guts, he had his epiphany. Colleagues of a veteran superintendent of a 30,000-student district in the South had begun to openly discuss his deteriorating health. Hints went nowhere. A friend who approached him became an ex-friend. A fellow superintendent showed how much he would make in retirement and how little he was earning by continuing to work. That did the trick. A highly recognized superintendent I knew in Maryland received a five-year contract extension only to be bought out three months later without any warning. Of course, being hit in the head with a hammer creates instant recognition. Equally troublesome is a slowly deteriorating relationship between the superintendent and the board of education. The signs may be subtle. Disagreements with board members are obvious. The rising number of edgy questions and “no” votes could be precursors of a gathering storm. Don’t count on formal job evaluations being the tea leaves for your future. Dissatisfied board trustees may submerge discontent until they have harvested sufficient termination votes. Superintendents who face unwanted departures usually have their difficulties start outside the board. School district staff members who feed gullible board members misinformation and rumors build a wedge between the superintendent and board. Add a few votes of “no confidence” from an aggressive teachers’ union and a waffling school board now has a weapon to use against the superintendent. The superintendent can weather isolated incidents, but his or her antenna should rise up. When negative issues arise in close proximity or when disgruntled parties join forces, the superintendent needs a strategy. Public calls for dismissal may be next, followed by coordinated attacks in the news media and at meetings. The superintendent should recognize attempts to destabilize his or her relationship with the board. The worst mistake is to ignore dissension as it leaves a stain. Whenever anything goes awry, past problems are resurrected to bolster arguments for a change at the top. As superintendent, my charge was to turn around Oklahoma City. There were numerous educational, financial and personnel problems to resolve, requiring massive change. We were able to reduce the number of at-risk schools from 32 to three. With all indicators improving, AASA recognized me with its Leadership for Learning Award. Yet, in spite of the accomplishments and public accolades, I recognized the day would come when board support would not be there. Outstanding results merely slow the inevitable. I began preparing an exit plan. By the time the composition of the five-member board had completely turned over, I was ready. I was escorted out with a huge party and a band instead of a lone bugler playing taps. Thinking ahead along the same lines, a superintendent in Northern California made this announcement on day 1: “I will work as hard as I can for five years and then retire.” She reminded the board of this every year. That’s giving notice! Announcing one’s intended finish a year or more in advance provides sufficient time for adjustments. Tension is reduced knowing the superintendent’s contract renewal is not up for discussion. The superintendent can challenge any board politicking as unacceptable and push forward on important goals. More notice produces a more relaxed transition process. How and when to make such an announcement and the reasons one gives for leaving will contribute to one’s legacy. Think diplomacy. Give others reasons to feel empathy. The classic fallback: I’m resigning to take care of or spend time with family. Sometimes, the timing of a planned retirement can taint the announcement, allowing perceptions to float in the air for awhile. A few days after a large district superintendent unexpectedly resigned to take a role in a nonprofit organization, a critical audit of the district’s finances became public. A Midwest superintendent announced her retirement at the beginning of an FBI investigation with a year left on her contract. A better way to leave after a controversy — even when the school board may have the votes needed for a dismissal — is to emulate what one Western superintendent with five years’ tenure did. After a slew of negative news, this superintendent vehemently denied he was going to resign. He quietly convinced his board it would be better if he eased himself out. After several months of calm, he resigned. Board members publically said that being superintendent was a demanding job. A superintendent in the Southeast was able to negotiate a consulting arrangement from her board in exchange for an immediate resignation. It was considerably less expensive for the board than buying out the unexpired contract. The entire board showed up for her retirement press conference. Board members made positive comments about her performance. Everyone handled her leaving with class. Superintendents with five, seven or nine board members should have the ability to count to three, four or five. When a superintendent with a seven-member school board senses only 3½ supporters, it may be a likely time to locate the exit doors. Smart superintendents counter criticism via political means early before momentum for ouster builds. The superintendent of an urban district in the Northeast always managed to get her photograph published in the local newspaper with supporters shortly after something had gone wrong. This publicity practice continued right up to her retirement. When the school board has the superintendent squarely in its sights, it is usually too late for a political response. A homegrown superintendent in the Mid-Atlantic region saw the handwriting on the wall but resisted. With a preacher’s charisma, he exploited his popularity to rally hundreds to meetings to oust the board members who opposed him. Compromise became impossible. His contract was bought out a year early. The superintendent lost, and the community was radioactive for years. Boards can drop the ax with no warning. The superintendent in a Midwestern state was fired at a specially called one-hour board meeting. This superintendent was undoubtedly upset — which may explain why he moved the next day. He elected to vacate the scene and regroup elsewhere before he did or said anything regrettable. Boards and superintendents who do not see eye to eye can accommodate one another through an agreeable separation. The superintendent’s primary interests may be (a) gaining time to find another position, (b) securing all the contract provisions and (c) extending one’s school leadership career. The board wants a change at the top and a smooth transition. Superintendents can best facilitate solutions. Superintendents should reach out to supporters and enable them to express their emotions. Enemies and detractors will react to how they interpret events. If the outgoing leader has a professional aura, they likely will be neutral. One exception: anonymous online postings, where nasty parting shots can be expected. Handled properly, critics will publically make left-handed compliments or even praise achievements. Attend your farewell receptions and parties and let everyone know how much you appreciate what they are doing for students. An unprofessional activity that the outgoing superintendent should scrupulously avoid is handing out promotions and salary increases as loyalty prizes. These decisions should be based strictly on merit with all employees considered and made by the next superintendent. A few superintendents, after announcing their departure, will manipulate events or the workings of the board to name an internal candidate as their successor. You expected the board to stay out of your business. Stay out of their selection role. Departing leaders ought to set up successors to be successful. Sacred cows may be slaughtered in advance of a new superintendent. Whenever I’ve been in the final stage of a superintendency, I personally contact the new superintendent for input on the next year’s budget and to gauge if he or she wants to interview candidates for any vacant positions. Be careful of what you initially say in your new community because you will be followed by those you’ve left behind. Any comments that even mildly discredit your former school community will be reported, possibly tarnishing your reputation. Almost certainly there will be folks who will keep you informed of every movement of the replacement superintendent. Watch what you say to keep from undermining your successor. Whether you were booted out from your previous berth or left under your own propulsion, there is a recovery period. Change and transitions expend emotional reserves that need recharging. Build some time and space into the process. Self-reflection will enable you to hone your craft so that when you move to a new post you are more experienced and wiser in advancing your own development.